Ruger Blackhawk - .44 Magnum. This is the original Flat top Blackhawk, though shooting .44 Magnum hot loads proved painful to users of this revolver, so Ruger eventually beefed up the frame, made it all steel and changed the trigger guard, coining the new modified Blackhawk to be the "Super Blackhawk". 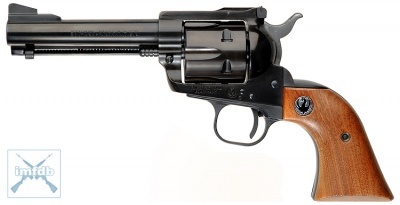 Ruger Super Blackhawk - .44 Magnum. Beefed up version of the Blackhawk with a redesigned frame to help with the .44 Magnum's recoil. Note the different trigger guard from the standard Blackhawk. New Model Ruger Super Blackhawk (Stainless Steel) - .44 Magnum. Note that this New Model retains the original trigger guard. The Ruger Blackhawk is a famed single action revolver first built by Ruger in the '50s. It is basically a Colt Single Action Army "Peacemaker" with a beefed up frame and cylinder, coiled springs, elevated and adjustable sights. Post-1973 models also incorporate a transfer bar, allowing the hammer to rest on a loaded cylinder without the risk of discharging the firearm, as well as simplified lockwork. It is sold in a vast array of calibers from .30 carbine, .41 caliber, .45 long colt, .22 long rifle and .22 magnum and the most popular .44 magnum and .357 magnum models.